SafeStep offers a choice of either prefabricated inserts or two types of custom molded inserts. Most patients can be accommodated with the prefabricated type. Medicare requires that the least expensive item be utilized that can provide appropriate therapy. 35 durometer base offers combination of shock absorption and durability. 3/16″ thickness Post-Lock base beneath ball of foot tapers to toes. Heat molds to ensure contact with foot. SafeStep custom inserts are manufactured using state-of the art 3D scanning technology. SafeStep securely archives the digital images to make reordering inserts easy and extremely accurate. SafeStep features two different versions of Medicare compliant custom inserts. The “Better” is firmer; the “Best” offers superior cushioning and accommodation. Also available are prosthetic fillers to accommodate partial foot amputations. SafeStep’s “Better” custom molded orthotic device is made with a SoftStep top layer and firm EVA base that maintains contact with the patient’s arch for the life of the insert. It is indicated for patients weighing less that 200 lbs. The insert is ground to the correct thickness to properly fit the shoe with which it is ordered. The orthotic can incorporate plantar accommodations at no additional cost to provide added pressure relief when required. SafeStep’s “Best” custom molded EVA insert is comprised of a SoftStep top layer a Recoil foam resilient shock absorbing middle layer and a firm EVA base. It is indicated for patients weighing more than 200 lbs and those requiring increased cushioning. 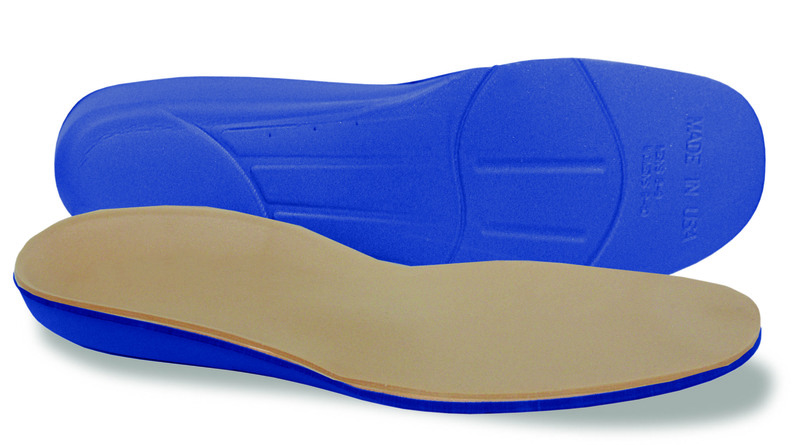 SafeStep’s “Best” custom molded EVA insert is fabricated with sufficient arch fill to provide total plantar contact.